I've seen several of Steven Segal's movies. I've usually enjoyed them, though the man really isn't that talented of an actor. This one is my favorite of his movies..and I think the best. The plot is entertaining even though it isn't the most original. It is a bit like Die Hard, but that didn't bother me. There is enough explanation in the movie for why Strannix and Krill are doing what they are doing..and for why Casey is able to deal with the situation almost completely alone. Things do start off a little slower while everything is set up. Once Strannix puts his plan in motion, the pace picks up a lot. There is a lot of action in the movie, including a few well done fights with Segal. The violence is a little graphic in a few scenes, but it isn't that bad overall. Strannix and Krill are a bit over the top, but they work great as villains. Strannix is complicated and perhaps a bit unbalanced. There is an intensity to the character that makes it clear he is willing to do anything to achieve his goal. He also calls himself RoadRunner and talks about other Looney Tunes characters, almost like he idolizes them or something. Tommy Lee Jones is wonderful in the part. I really don't think the character, and as a result the movie, would have worked as well if someone else played Strannix. Krill is definitely unbalanced and more than likely willing to kill his own mother if it will serve his needs. Gary Busey plays unhinged really well. I've lost track of how many times I've seen this one over the years. It works well as an action movie and I still enjoy it. It is definitely worth watching. 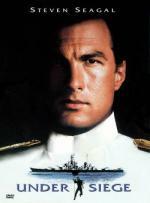 I have to admit, I'm not a Seagal fan at all, but this film is a guilty pleasure. In the second part he rescues Katherine Heigl. He shouldn't have done that. Hey, I thought there was some law that said every Seagal movie title had to consist of 3 words? His first few did have 3 word titles...I'm thinking this is the first one that didn't. A quick count shows 11 movies, where he is the main character, that have a 1 or 2 word title. he dies in the first 20 minutes! I do enjoy Under Siege. And I thought Above the Law was a decent story. The rest of his work goes downhill very fast. I've enjoyed several of his other movies...but I do fully admit none of them are really great. He does fine with the action stuff, but he doesn't have much acting talent. I have never sought out any of his movies...he just doesn't seem the type to interest me. But I did like his appearance on The Bonnie Hunt Show this past year. Of course, the fact he was only on the show for about 10 minutes may have added to my enjoyment. I missed his appearance on Bonnie Hunt. The length may be why you liked it. Under Siege may be the only Segal movie I have ever seen in its entirety (even at the cinema!). I enjoyed it for what it was, there is lots of action to be one entertained and Tommy Lee Jones' overacted bad guy (pre-Agent M fame) is fun to watch.